Wall Street is worried about a trade war. The Dow dropped 420 points on Thursday after President Trump said his administration will impose tariffs on steel and aluminum imports. The Nasdaq and the S&P 500 declined 1.3% apiece. Trump's controversial tariff announcement caught investors off guard and immediately raised concerns about retaliation from China or other major U.S. trading partners. "This is the first shot across the bow over a trade war," said Art Hogan, chief market strategist at B. Riley FBR. "And nobody wins a trade war." 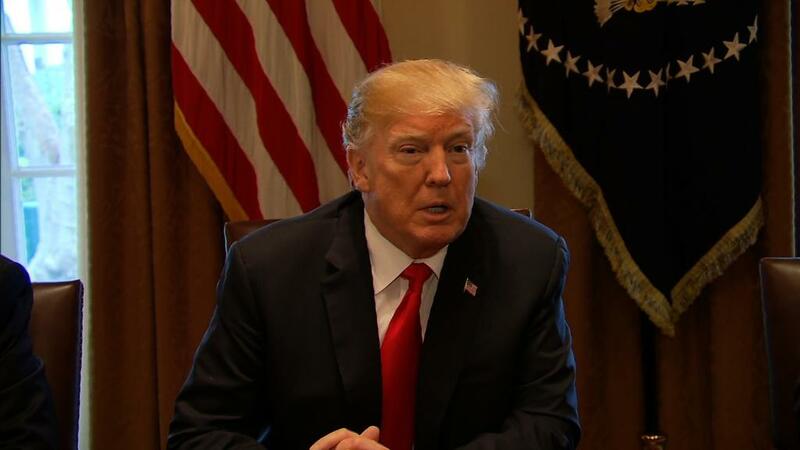 Trump said his administration would impose a 25% tariff on steel imports and a 10% tariff on aluminum. It was not immediately clear whether Trump would exempt some countries from the tariffs, as his national security advisers have urged him to do to avoid hurting U.S. allies. Corporate America has warned Trump that tariffs could backfire. Last month, the Business Roundtable warned of the risk of "foreign retaliation" that would "harm the U.S. economy." Investors will be looking to see how U.S. trading partners react to the tariffs. Beyond worries about retaliation, the tariff news drove concerns about rising costs for companies that rely heavily on aluminum and steel, like auto and plane makers. Imports make up about a third of the 100 million tons of steel used by American businesses every year. More than 60% of the overall market for aluminum supply comes from imports, according to the Aluminum Association, citing 2017 data.. Shares of Boeing (BA) fell 3% General Motors (GM) dipped 4%, and Ford (F) dropped 3%. If the tariffs result in higher prices on steel and aluminum, companies that rely on those products may pass on some of the costs to consumers. That raises the specter of creeping inflation. "This clearly will [lead to] higher prices in the production chain, which is part of the inflation path," said Quincy Krosby, chief market strategist at Prudential Financial. The timing of the tariff news surprised Wall Street. A formal announcement was expected at some point Thursday, but then it was called off. Later, Trump mentioned his tariff plans in a hastily arranged listening session with steel and aluminum executives. And he didn't provide crucial details, such as whether certain countries will be exempted. Concerns about trade come at an already shaky time on Wall Street. The S&P 500 and Dow fell about 4% in February, their worst month in two years. Fears about inflation and soaring bond yields caused a surge in volatility, including two 1,000-point plunges for the Dow. The market had come back as investors focused on the strong economy and booming corporate profits. But stocks fell sharply again on Tuesday and Wednesday, putting the Dow back in negative territory for the year. Turbulence has picked up as well. The VIX (VIX) volatility index spiked 15% on Thursday. Selling pressure will climb as volatility increases, Krosby said. 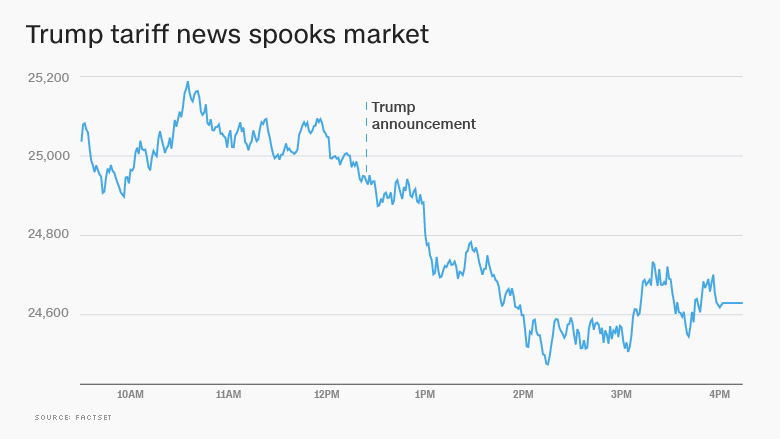 At least two corners of the stock market cheered Trump's tariff announcement. U.S. Steel (X) and AK Steel (AKS)soared 6% and 10%, respectively. Century Aluminum (CENX) also spiked 7%. Another major aluminum maker, Alcoa (AA), gained 1%. Trump's tariff moves could force investors to confront another trade issue: NAFTA. Trump has repeatedly threatened to tear up this major trade deal with Canada and Mexico. Talks to renegotiate NAFTA, a major piece of the U.S. economy, have so far failed to produce a solution. "It sets off the protectionist fears that had been lying dormant," said Hogan. — CNN's Jeremy Diamond contributed to this report. Correction: An earlier version of this article incorrectly stated the amount of aluminum used in the United States that is imported.